If this is the year you’ll venture out of your cruising comfort zone and head “downeast,” here are a few comments and tips to make your cruise a success. Maine is a long way from Long Island Sound (LIS). From Branford, CT to the east end of the Cape Cod Canal is about 120 miles, and from there to Southwest Harbor, ME is another 180 miles. Even optimistically at a 6-knot average speed, that’s 30 hours of non-stop sailing. If you only do 30 miles a day it would take six days! Obviously, if you want to “cruise Maine” and don’t have the whole summer, you have to be a bit more aggressive in your daily targets. Running non-stop, overnight is one solution but unless you’re experienced at this, it’s tough. A good “plan B” is to run long days of 50 to 80 miles and, if you’re up to the challenge, run one “overnight” during the offshore segments to minimize the hazards of rocks and currents or run overnight on a segment you may have done before, such as Branford to Point Judith, RI. Plan to leave so that you can clear The Race or Watch Hill Passage with a fair current. Check the currents for your departure day. The Eldridge Tide and Pilot Book has a wealth of data and info that can help you along the way on your trip to Maine. You can buy it at many of the providers or ship’s stores advertised here in WindCheck. True, you can get most of the info in it online, but the convenience and dependability factor makes it well worth the modest cost. It’s also great reading if you’re stuck on the boat in the rain in some quiet little anchorage in Maine. Use the section called “The Race Currents” and the accompanying current charts to make sure you won’t have to fight the current on the first day of your trip. If you can’t make it out of LIS or Fishers Island Sound on day one, plan to stay in West Harbor or East Harbor on Fishers Island or Stonington Harbor for an early departure to take full advantage of the next day’s fair current. Plan to clear the Cape Cod Canal with a fair current. The anchorage at Richmond Island is secluded and quiet. hours. In the summer months you can run to Maine without sailing overnight by carefully planning stops that are close to the rhumbline, and if you get a good day you can run from first light until dusk and have a 12- to 15-hour run. This approach will get you to Maine in a hurry without the fatigue and “tension convention” of running all night. 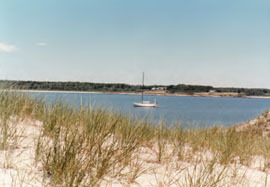 Some good spots between LIS and the east end of the Cape Cod Canal (CCC) are Point Judith Harbor of Refuge, Cuttyhunk, Hadley Harbor, Wings Cove (Sippican Neck), North of Great Hill (NW of CCC west entrance) or Onset (west end of CCC). All of these “quick in, quick out” stopovers are weather and draft dependant, but all have more protected harbors close by if more protection for the night is needed. More experienced sailors can extend their “current” day by running up through Vineyard Sound, versus Buzzards Bay, and through Woods Hole, although Woods Hole can be a very intimidating place and is not recommended for the novice. A quick stopover on this route is Tarpaulin Cove on Naushon Island or Hadley Harbor once through Woods Hole. If you have to contend with some foul currents during your day, plan them for early morning. In the early hours, when it’s typically light or calm, you’ll often be motoring anyway. 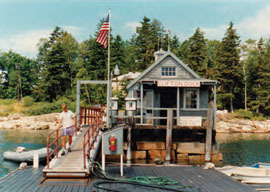 This fuel dock is located in Northeast Harbor. the first hints of dawn without much fanfare. Make sure you “pay up” the night before, as there is nothing more frustrating than waiting for a marina to open so that you can leave! Summer mornings in New England are often flat calm. Since you’ll be running your engine anyway, if there is some lingering foul current you won’t notice as much. Use this time of the day to keep putting on some miles, get the main uncovered and up, and rig the sails so you’re ready when the breeze starts to fill. East of CCC the next spot is Scituate, MA. Some will tell you Plymouth and on the chart it looks OK, but unless you just duck around the corner of Saquish Neck, it’s quite a long run in and out. Currents in Plymouth also can make anchoring a frustrating matter as the currents often overrule the wind and you end up with your rode running back under the boat…not cool! Scituate Harbor is an easy place to get in and out of, has a couple great yacht clubs with moorings and launch service available for visitors, and with several quality restaurants it is a nice place to go ashore for a “night out.” Scituate is about 26 miles from the east end of CCC. The next easy harbor close to your track is about 25 miles further, behind the breakwater at Eastern Point, Gloucester. In several of these harbors you can probably anchor if you’re really trying to scrimp, but the ease of picking up a mooring and leaving in the early hours makes the cost of a mooring and launch service – often with showers available – a bargain! Once again, make sure you “pay up” the night before so you can leave early. Don’t ever be tempted to leave early and skip paying. You may want to stay there again…and they will remember! If you stop for six hours, a problem current will be reversed when you leave. If you stop for 12 hours, it will be the same. Plan accordingly. The next morning you can leave very early out of Gloucester, even before sunup, and get a good start. The channel is well marked, and if you stay out of the fishing boats way you’ll have no problem. A long day can have you eating lobster in Maine that night! After leaving Gloucester, you will round Cape Ann in about 10 miles. When you hang that left, you’re really heading for Maine and it will begin to feel like it! Next stop, if you want a fairly easy run, is Pepperell Cove in Kittery ME, a little under 30 miles from Cape Ann. The harbor is easy to make, even if you are running out of light. There is a set of range lights on Kittery Point that will help you navigate to Pepperell Cove. This is part of Portsmouth Harbor, so keep a good watch and respect commercial traffic. A Portsmouth Yacht Club mooring in Pepperell Cove (portsmouthyc.org) will also get you a launch service to a nice dinner ashore, either on the Maine side or across the river in Portsmouth, NH. You may have noticed that I skipped Isle of Shoals. It can be a fun place for an adventure, but there aren’t many facilities there and finding a mooring can be a problem. Motoring out of Pepperell as the sun rises over Wood Island the next morning can be a treat, and has a real Maine “feel” to it. You may have already seen whales off Boston or Cape Ann, and from now on the chance of seeing seals is very good. You’ll also note a change in the species of birds encountered. As you head up the next leg, your course will have more north in it and you’ll likely have a better sailing angle to a frequent southwesterly breeze. The next stop is Richmond Island, a remote place west of Cape Elizabeth with easy access. There are no facilities, but great scenery and good protection. The slight roll from waves coming over the causeway at high tide can sometimes be a nuisance but it helps keep the crowds down and it stops when the tide goes down. In these harbors, a second anchor – even a small one – can sometimes help orient the boat into a swell. If Casco Bay is your target for this year’s trip to Maine, you’ve arrived, and I’m sure after you’ve tasted the fruits of Maine cruising, you’ll be back many times. But for those who want to drive a bit further downeast, there are a few more spots that can help get you there. If it’s foggy, sail offshore and well clear of hazards or motor very carefully through the bays and hope for less fog closer to land…not always the case! Or, stay put! Leaving Richmond, another 25 miles brings you to Seguin Island where you can anchor but may find it a bit rolly depending on the weather. Be careful until you get a feel for anchoring in Maine. Use the right gear and enough scope. Less than 10 miles to the NNE you’ll find Christmas Cove on Southport Island. Christmas Cove is one of the sweetest spots on the Maine coast for a lot of reasons. The beauty is but one, and overlooking your boat at the Coveside Restaurant (covesiderestaurant.com) while you enjoy a great meal is definitely high on the list! Like many other harbors in Maine, if you enter at high tide, it will blow your mind to see all the rocks that appear at low water. Pay very close attention to your navigation and always know exactly where you are. If you’re anchoring, make sure there will be enough water as the tide goes out. If you find a “nice open spot” to anchor, remember that it might be a “nice dry spot” at low tide! With Christmas Cove as a starting point you can poke around for weeks in Boothbay, Sheepscott Bay, Linekin Bay and Damiscotta River and never hit the same place twice. 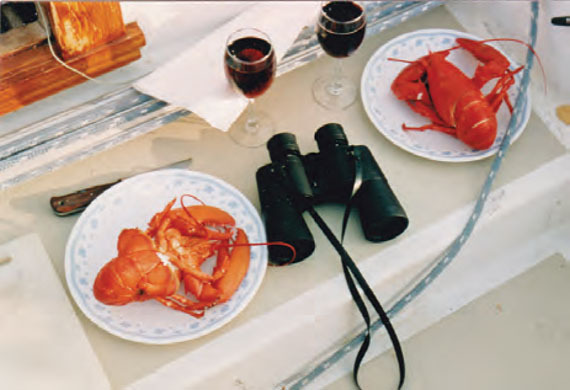 When you’re cruising downeast, you can often buy lobsters right off a lobster boat. If you’ve still got time to burn and want to press on, there are two ways. Head out from Christmas Cove about 10 miles to get offshore and continue “downeast,” or clear Southport Island and then run through the rocks and passages to the East. Either way, 20 miles or so will have you in Muscongus Bay where there are plenty of well known and worthy spots, then Port Clyde marking the entrance to Penobscot Bay with another lifetime of cruising spots. Depending on the weather and your determination to get further east, you can stop at Tenant’s Harbor, any of the wonderful places on Vinalhaven Island, or motor through Fox Island Thorofare for a special visual treat. Definitely study the cruising guides; both the Cruising Guide to the New England Coast (also known as “Duncan and Ware”) and Tafts’ A Cruising Guide to the Maine Coast. You’ll be finding you own favorite spots by now, guaranteed! Twenty-five miles east of the Thorofare you’ll find Mount Desert Island, where you can fill all your needs at Northeast Harbor or explore Somes Sound, Frenchman’s Bay, and other gorgeous spots. Northeast Harbor is also a good base if you want to hike in Acadia National Park. Keep a detailed log. Not only navigational but places, names, other boats met, launch operators’ names, VHF channels, etc. You can also write pertinent info in the margins of the cruising guides. It’s an easy way to look up info when you return. Now that you’ve reached Mount Desert Island, you’ve probably earned your stripes and know how to look at a chart to find you own favorite spots. Remain faithful to your navigation as unlike the sandy shoals of LIS, Maine rocks can be unforgiving! Enjoy the beauty of Maine (and sometimes its harshness) and meet some of the people. Keep some cash in small bills aboard so you can buy lobsters off a local boat pulling traps nearby…a couple cold beers often make a good tip. Ernie Messer has been sailing since the 1970s. He is a member of the Cruising Club of America, Off Soundings Club and Shennecossett Yacht Club. He and his wife have sailed New England for many years and have also raced to Bermuda frequently, including three times double-handed! They sailed for 15 years on their Tartan 41 and now sail on a restored Peterson One-Ton, Valour, out of Westbrook, CT. Plans this summer focus on the Marblehead to Halifax Race and an extended cruise back along the Maine coast including, of course, Christmas Cove! « Drill, Baby, Drill – Reading Weather Reports!